In the absence of an actual Dungeons & Dragons RPG between January 2012 and July 2014, between Dungeons & Dragons Fourth Edition and the recently released Dungeons & Dragons Fifth Edition there leapt into void not one but two contemporary takes upon traditional fantasy roleplaying. Of course, the term ‘void’ is relative, since Paizo Publishing’s Pathfinder Roleplaying Game is still available, as are any number of Old School Renaissance titles, from Labyrinth Lord to Lamentations of the Flame Princess Weird Fantasy Roleplaying. The first of these is 13th Age, Pelgrane Press’ action-orientated RPG that energised the Dungeons & Dragons style of play. The second is the Monsters & Magic Roleplaying Game. Published by Mindjammer Press, unlike the other Dungeons & Dragons style RPG, it is not a d20 System derived RPG, but uses its own Effect Engine mechanics to bring in storytelling mechanics that sit upon the architecture of nearly forty years of roleplaying that is Dungeons & Dragons. It has been described ‘Dungeons & Dragons meets FATE’, in that it employs descriptors—in Evil Hat Productions’ FATE called Aspects, in Monsters & Magic called Traits—that can be invoked to grant a benefit to the players’ adventurers. The result is that each and every adventurer brings more of his character to the play of the game and to the game world—more so than traditional Dungeons & Dragons. Further, it is possible to take characters from your existing Dungeons & Dragons game and slip them into a Monsters & Magic game, and in the process bring the characters alive. Coming with the tagline, “Old School Fantasy, New School Play”, Monsters & Magic is still a classic Class and Level RPG. The classic races are present—Dwarf, Elf, Gnome, Halfling, Half-Orc, and Human, as are the classic Classes—Cleric, Fighter, Thief, and Wizard. The other classic Classes are treated as sub-Classes, so Druid and Monk are sub-Classes of the Cleric Class. In this way, the Paladin, Ranger, Illusionist and Specialist Wizard, and Assassin and Bard are all present. If there is an edition of Dungeons & Dragons that Monsters & Magic is based upon, it is certainly Advanced Dungeons & Dragons, First Edition. (It should be noted that the Berzerker Class is present as an example of how to create a new sub-Class, but it is not included in core set of Classes). Further, the classic six attributes—Strength, Dexterity, Constitution, Intelligence, Wisdom, and Charisma are rolled on three-six-sided dice and the Classes function as you would expect. So the Cleric Class can Turn Undead, cast Clerical Magic, Wear Light and Medium Armour and use Shields, and so on, whilst the Ranger can Wear Light and Medium Armour and use Shields, use Bows and One-Handed Swords, is an Enemy of Humanoids and Giant-kind, can Follow the Trail, is Solitary, and is skilled in Woodcraft and Scouting and Spying. As can be seen from this sample, a character in Monsters & Magic looks very much like a character from almost any Old School roleplaying game, though there are notable differences. A character has both Physical Hit Points and Mental Hit Points—so he can take both mental and physical damage—and Mental Hit Points means that characters can suffer sanity inducing shock and engage in social conflicts; he has Hero Points to help him get out of bad scrapes; and an Alignment Focus which helps him roleplay his Alignment and an Alignment Drift which represents the temptations that will push him away from his current Alignment towards another. Playing to either his Alignment or his Alignment Drift will gain a character Experience Points for good roleplaying. One major notable difference between a character in Monsters & Magic and another Old School RPG is that each Class has a primary attribute, the modifier for which is doubled. Thus if a Cleric and a Magic User both had an Intelligence of 16, the modifier for the Cleric would be +3, but doubled to +6 for the Magic User as Intelligence is the Primary Attribute for the Class. What this does is empower each Class through the Primary Attribute. At the heart of the character and of Magic & Monsters are Traits, each “a single word or short phrase describing something crucial about your character, like an ability, background story detail, or personality aspect”. In play, they enable a character to bring one or more of these into play and have it directly affect the game in play. Most of a character’s Traits will come from his Race or his Class, but they will also come from a come from a character’s Alignment and from his Background Trait—such as Ex-Royal Courtier or Grew up an urchin on Swill Lane. He could also take a special item, perhaps an heirloom. As a character gains a Level, he can gains more Traits. Some of these will come from his Class, others from his Background and his adventuring life, or indeed, he could discover more of the capabilities of his heirloom and give it another Trait. Both the Attribute Modifiers and the Traits play a major role in Monsters & Magic’s mechanic, known as the ‘Effect Engine’. To undertake an action, a character rolls not a twenty-sided die, but three six-sided dice. To this roll the character adds an attribute modifier, but if the situation warrants it, a character can add not just one, but various Traits up to a certain limit. The first Trait is equal to the character’s Level, but any subsequent ones are worth a simple +1. Rolls can be made against set difficulties—Average is 10, Tough, is 15, Difficult is 20, and so on—or against static values such as Armour Class or the resistance values derived from a character or an NPC’s attributes. All a player has to do is describe how his character uses each Trait and it is allowed by the GM. The result of a roll in the Effect Engine is where Monsters & Magic gets interesting. If the result of the roll exceeds the difficulty, Effect Points are generated and these can be used in a variety of different ways. At the most basic, if a character targets an NPC or a monster, then the Effect Points can be turned into points of damage, these in addition to the damage rolled for the weapon or the spell. Generate enough Effect Points and they can be used to generate ‘Minor’ Effects (5 Effect Points), ‘Major’ Effects (10 Effect Points), and ‘Extreme’ Effects (15 Effect Points), that are placed on the target. A ‘Minor’ Effect would be to gain a +2 bonus or impose a -2 penalty, move a Range Band, mount or dismount a horse, sheath or draw a weapon, change stance, use up a minor resource such as an arrow or a dropped item, and so on. A ‘Minor’ Effect can be used to negate a ‘Minor’ Consequence that has been imposed on a character. Both ‘Major’ Effects and ‘Extreme’ Effects work in a similar fashion. For example, Laurenel is travelling at dusk in the Mountains of the Neck when he is ambushed by an Orc Warrior. Unlike his peers, this Orc likes to hunt his prey using a bow and arrow rather than just his cruel sword. Fortunately for the Elf, the Orc misses, but Laurenel needs to spot where the ambusher is. Spotting the ambusher is a Wisdom check, so that adds +1 to the roll, and his player suggests that both of his Excellent Perception and Infravision Traits will help him. The GM agrees, which adds a further +1 for each Trait. Laurenel’s player rolls 15 and adds the +3 to give a result of 18. The Orc Warrior has a Dexterity Resistance of 12, so the result of 18 is not only a success, it also gives Laurenel 6 Effect Points to spend. He spends it on a Minor Effect he calls ‘Obvious’, which he describes as the Orc having camouflaged himself poorly. It grants the Elf a +2 bonus to hit. Having spotted the Orc Warrior, Laurenel lets fly with a Magic Missile spell. He will add +6 to this roll for his Intelligence modifier, +1 for his Magic Trait, and of course, +2 for the ‘Obvious’ Minor Effect. In total, he as a +9 modifier to the roll. The Orc Warrior’s Armour Class is 20. Laurenel rolls 14 and adds the 9 to get a total of 22. This generates 2 Effect Points—not enough to buy a Minor Effect, so Laurenel decides to inflict 2 more points damage and rolls 1d4+1 and adds another 2 points to the total to get 6. If a roll is failed, a character can suffer Consequences. Essentially, these work just like Effects, but with a negative result rather than the positive ones of Effects. Should a character suffer any Consequences, then they can be negated by purchasing counter Effects. For example, in a later round, Laurenel decides to push forward to attack the Orc Warrior with his quarterstaff. So he rolls three six-sided dice, adds his Strength modifier (0), his Use Quarterstaff & Daggers Trait (+1), and the ‘Obvious’ Minor Effect (+2). The difficulty for the roll is the Orc Warrior’s Armour Class, which is 20. Unfortunately, Laurenel rolls a total of 15, which is under the target. The GM uses these points under the target to impose a Minor Consequence (-2) on Laurenel, which is ‘Twisted Ankle’ as the Elf gets caught up in the undergrowth. With its Consequences and Effects, the Effect Engine can be a whole lot deadlier than the standard play of a d20 System fantasy RPG, especially as characters progress in Level and the rules for Scale come into play. At 5th Level, a character gains access to the Heroic Scale, at 10th Level he gains access to the Epic Scale, at 15th Level he gains access to the Legendary Scale, and at 20th Level he gains access to the Mythic Scale. At the Heroic Scale, a character can build himself a Reputation, build a community or gang around him, or put together a ship’s crew; at the Epic Scale a character can build strongholds or domains, and engage in politics, diplomatic, or courtly actions; at Legendary Scale, a character is capable of working at the level of kingdoms; and at Mythic Scale, he can influence the fates of nations, peoples, and even whole worlds! As a campaign grows in Scale, so does the level of Effects, from Heroic (+8) on upwards. Another area in which the players have input during play is when it comes to determine treasure. A GM can define what loot a monster might have or what exactly is held in a hoard’s horde, but he can award the players Treasure Points. These can be spent to purchase types of coinage, gems and jewellery, and special items. More of the former have to be purchased using these Treasure Points before the latter. To this point Monsters & Magic is decently supported with some excellent full examples of play that show how the Effect Engine works. These are necessary because the book in places lacks that clarity that it needs to impart the differences between traditional fantasy roleplaying and the narrative demands of Monsters & Magic. The support provided elsewhere in Monsters & Magic is disappointing—only First and Second Level spells are listed and only a handful of monsters are included. This has a number of consequences. First, any spell casting character must have access to the core rules or player’s rule book for another fantasy RPG if he wants spells of a greater level. Second and likewise, the GM will access to the core rules or a bestiary for another fantasy RPG if he wants more monsters. In either case, they will want access to these books, and as a third consequence, in the long term Monsters & Magic is not a wholly standalone RPG. On the plus side, converting spells and monsters from other fantasy RPGs is not all that challenging. Guidance is included to help a player convert his character from that other fantasy RPG into Monsters & Magic, and the monsters included showcase how they should look after conversion. Just like characters, monsters in Monsters & Magic have their own Traits. This also points to another possibility. That of adapting and running other Old School fantasy RPG settings to run using Monsters & Magic. Want to use these rules to run a Dragonlance campaign or a Dark Sun campaign? Such a conversion could be done because Monsters & Magic would simplify the abilities and backgrounds found in the character types and monsters those settings into Traits. Rounding out Monsters & Magic is a scenario. ‘Silvermoon’ describes a village wrapped and cowed in the mists known as ‘Moonbreath’ that waft their nightly way down from the craters of Moon Moor. It is a fairly short if detailed affair, and should provide two or three sessions of play. Physically, Monsters & Magic is decently illustrated in an Old School style. The cartography, what little there is of it, is excellent though. The writing is generally clear, but in places it could be better and the examples of play often do a better job how the rules should work. 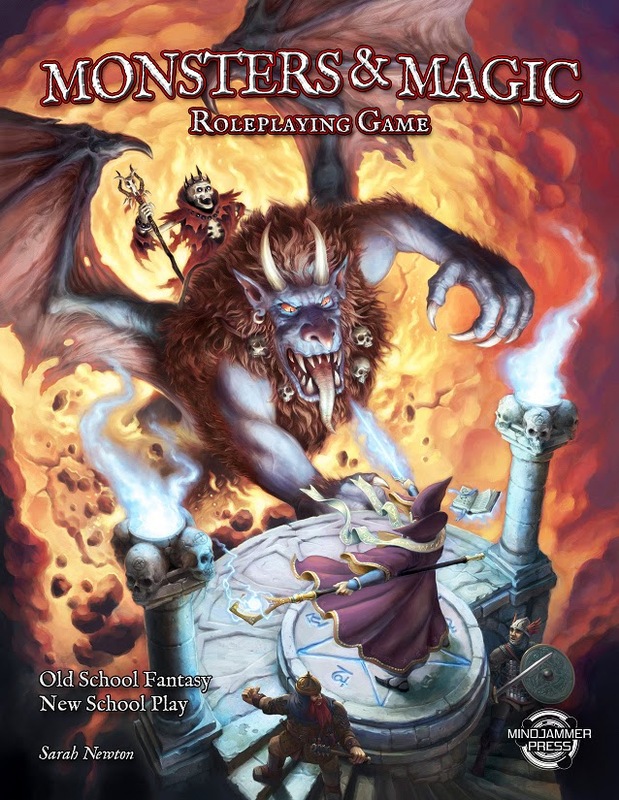 Monsters & Magic is not a fantasy RPG designed to introduce new players to the hobby. In places, it is too complex for that, and in others it does not explain the rules quite as well as it should. Rather it is a fantasy RPG in the classic mode of Dungeons & Dragons designed to appeal to more contemporary mores that want a player to have greater narrative input into the play of the game. The Effect Engine and its use of Traits brings in a mechanical and narrative flexibility not present in Old School fantasy RPGs, but builds it around the structure of the Old School fantasy RPGs to make Monsters & Magic accessible and familiar to gamers of all preferences.